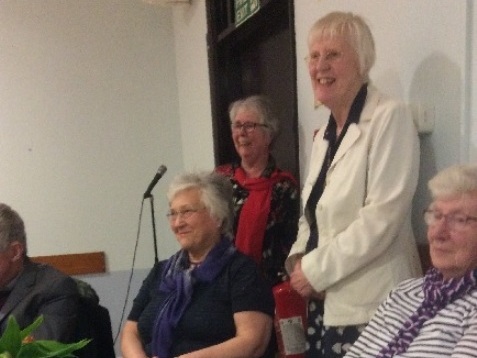 A joyful celebration for the Feast of St Julie was held at the Immaculate Conception Church in Glasgow. An open invitation had been sent to former pupils and members of Staff of schools and the College of Education and the church hall was full. 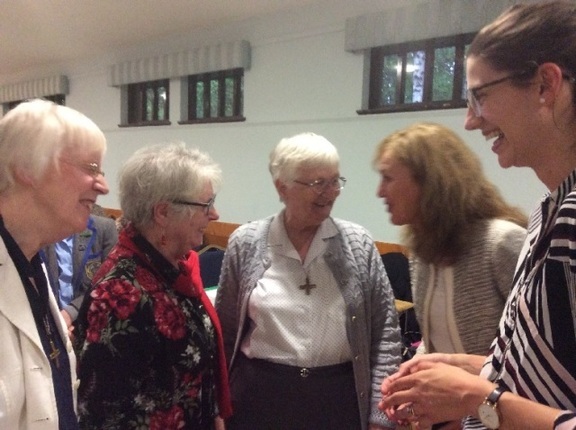 After a welcome and introduction by Sr Isabel Smyth, a gathering prayer prepared by Sr Margaret Rose Bradley began the evening with Sisters reading from the Charism section of our Constitutions. 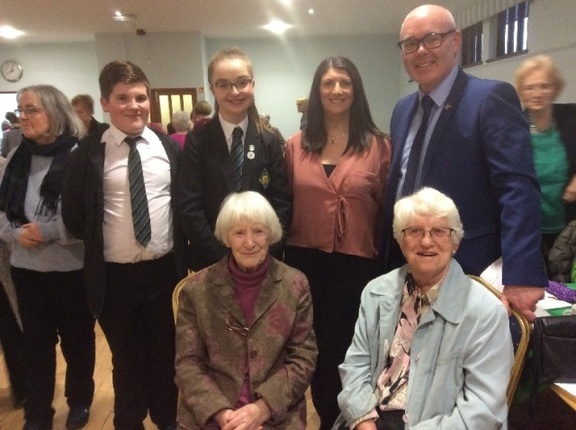 The three associated Notre Dame Schools in Scotland - Notre Dame, Dowanhill, Fernhill and Our Lady and St Patrick's Dumbarton - had been invited to participate in the evening. Three S1 girls from Notre Dame, Dowanhill, accompanied by two members of staff, shared some notes from the school Log Book and Inspectors' Reports from various years since 1897, when the school began with 24 pupils. 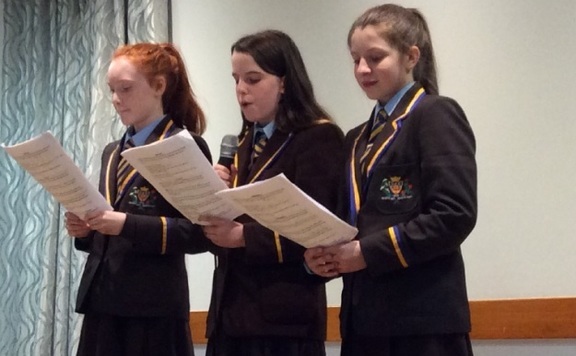 The presentation also included memories and comments by former pupils from different times of the school's history including comments about uniform and lessons. Inspectors' Reports were consistently good and each report commented on the atmosphere and ethos of the school. Children from the Primary and Secondary sections of Fernhill with the Head Teacher and the Head of Music were the third school to participate. The Head Teacher of Fernhill is also keen to develop links with the Sisters and to keep alive the spirit of St Julie and Notre Dame. The children spoke of the history of their school and the influence of the Notre Dame Sisters who taught there. 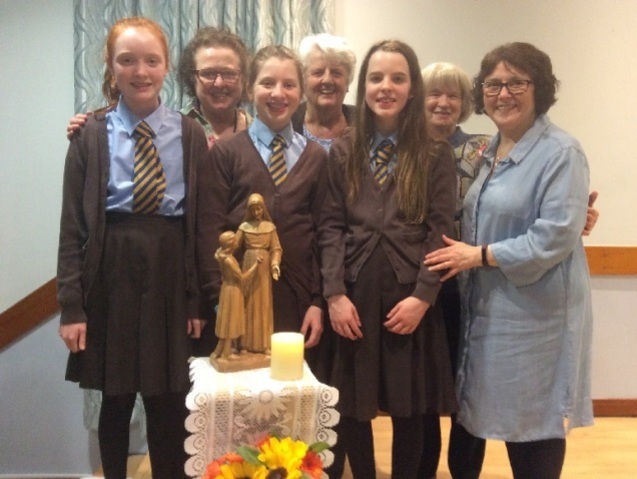 Their school House groups reflect this history and the names also honour Scotland and have a link to the Sisters of St Joseph of Cluny, since one of the Sisters from this Congregation was Head Teacher for some time after Notre Dame moved on from Fernhill. Some of the Sisters have already visited Fernhill and the Head Teacher said she would be very pleased to have Sisters visiting the school. 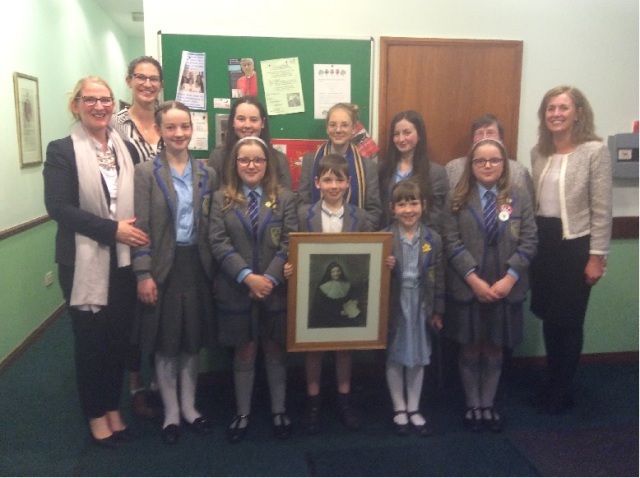 First Year Pupils from Notre Dame Dowanhill with Sisters Mary McClure and Alice Garrity. The Headteacher of Our Lady and St Patrick's in Dumbarton brought 2 pupils with him as well as the Head of the Religious Education Department. For their presentation a video was shown which included the last few days of the old building with many former pupils coming along to see their place of education one more time. The new school is now in Bellsmyre in Dumbarton and in the entrance hall are 2 mosaics, one of Our Lady and one of St Patrick. The mosaics came from Notre Dame High School for girls and St Patrick's High School for boys and when the two schools joined to become one both mosaics were found in the Notre Dame building. With the mosaics now placed in the new high school a bit of history is retained and between the two mosaics there is a statue of St Julie. The Head Teacher is keen to develop links again with the Sisters and he issued an open invitation to any Sister any time we find ourselves in Dumbarton. The three presentations were very interesting and very different and showed that the spirit of St Julie is alive and tangible in these new generations. Sr Gail Taylor provided everyone with St Julie bookmarks. They were delighted with them. 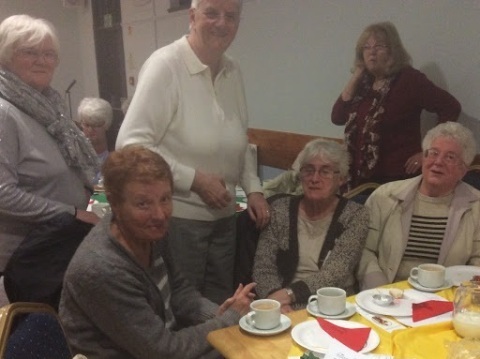 A delicious buffet was provided by the women of the parish and they looked after everyone very well. The evening concluded with the singing of the new St Julie song by Mike Anderson, Chaplain at St Julie's, Liverpool, sung with more enthusiasm than accuracy perhaps but this meant that the new song was shared with a new group of people. It should continue to spread Julie's spirit and joy wherever it is sung.